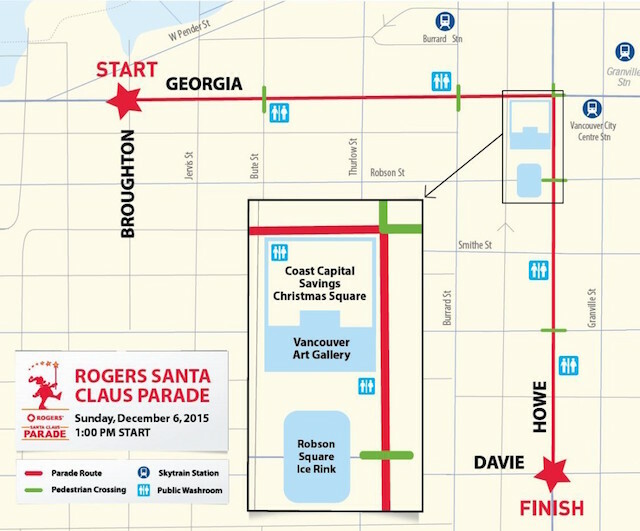 The 12th annual Rogers Santa Claus Parade will hit the streets of Downtown Vancouver on Sunday, December 6, 2015 at 1:00pm in support of the Greater Vancouver Food Bank Society. This festive event, including many local organizations and businesses, is a kick-off to the holiday season for many and will be filled with family fun. Starting out at 1:00pm, the parade will begin at West Georgia Street and Broughton, travel east along West Georgia, turn south on Howe and finish at Howe and Davie. Over 300,000 spectators flock to this event each year so be sure to arrive early to stake out your viewing spot. You can also enjoy many activities around the Coast Capital Savings Christmas Square (in front of the Vancouver Art Gallery) that will be open form 10:30am to 1:00pm. The square will have a gingerbread decorating station, face painting, letters to Santa station, and an entertainment stage featuring exciting music and dancing performances. That is where you can also drop off your donations to the Greater Vancouver Food Bank Society. Along the route, volunteers will collect non-perishable food items and monetary donations on behalf of the Greater Vancouver Food Bank Society. For every $1 donated, the Food Bank can purchase $3 worth of food – so remember those loonies on Parade Day! Follow the parade on Facebook and Twitter with #RogersSantaClausParade for the latest updates. I will draw one winner at random from all entries at 12:00pm on Wednesday, November 25, 2015. Update The winner is @lainiesoleil77! I’ll be donating soup, pasta and sauces, and baby items like diapers. Or cash so they can invest in food they need throughout the year. We always bring pasta, tuna, and peanut butter as well as cash! Pasta and Rice for sure, + whatever else I happen to grab when getting that. I’ll be bringing canned soup, canned vegetables, and a jar of 100% peanut butter, cause I often use these goods in my own home. Pasta, canned veggies, canned fruit, tuna! I’ll donate some canned food and a some new in the box toys I’ve ended up with that my kids don’t want. We’re bringing hearty stews, chili and soups… perfect for the winter! My husband and 2 year old daughter both hate canned tuna, so they’ll clear the cupboards of any canned fish, too! Canned salmon for sure and probably some canned vegetables too! We always donate peanut butter and pasta! I would donate baby formula and cannes goods! Every year we donated canned food like soup, noodles, tuna etc. Pasta, canned food and baby items. We will bring some almond butter, canned fish, and some baby food or diapers. And loonies of course! Thank you! We would bring pasta and sauce, along with canned fruit. We’ll bring loonies and canned food! Probably cash, it’s lighter to carry and they can get exactly what’s needed. Definitely will bring pasta or rice and canned fish. I will be donating cash. I usually donate formula and diapers. Canned goods, pasta, formula, diapers. Cash seems to provide the best return for the food banks, so I usually do that. We will bring loonies and canned food. I would donate cereal (Frosted Flakes, Cheerios…)It would be a treat other than the normal things they receive, and everyone donates this time of year. Would be a wonderful way to see the annual Santa Clause Parade. Good luck everyone! I’ve already picked up pasta, tuna, beans and rice. Will probably get some soup and peanut butter as well. Definitely cash – to take advantage of the Food Bank’s purchasing power! I have canned food that I’d love to donate, soups, sauces, beans. I am donating some food. Organic tinned beans and vegetables and pouches of ready to eat rice and Indian food. Canned kidney beans, corn, soup, pasta etc.